Welcome to free new escape games on the internet. You can find the best enjoyable and quality games on our site. We offer you the best point and click games for many years. You can choose your favorite games through thousands of kidnap games. If you like "escape the room games", you will appreciate our site. Have fun. 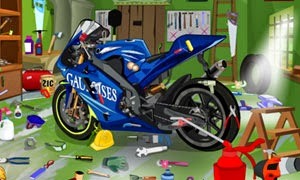 Moto Garage Hidden Objects is nice lost objects game by DG77. Good luck and have fun.